Johnny David Damon (born November 5, 1973) is a retired American professional baseball outfielder who played in Major League Baseball (MLB) from 1995 to 2012. In his MLB career, Damon played for the Kansas City Royals (1995–2000), Oakland Athletics (2001), Boston Red Sox (2002–05), New York Yankees (2006–09), Detroit Tigers (2010), Tampa Bay Rays (2011) and Cleveland Indians (2012). Damon also played for the Thailand national baseball team and was a member of the squad for the 2013 World Baseball Classic qualifiers. Damon was born in Fort Riley, an Army base in Kansas. His mother, Yome, was a Thai immigrant to America, and his father, Jimmy, is an American of Croatian and Irish descent. They met while his father, a staff sergeant in the United States Army, was stationed in Thailand. Damon spent much of his infancy as an "army brat", moving to several bases from Okinawa, Japan, to West Germany before his father left the army and settled the family in the Orlando area while Damon was still a pre-schooler. Damon was a quiet child, largely on account of a fluency disorder. "My thoughts just raced ahead of my tongue", says Damon of his problem then. "I'd sing songs as therapy, and I got better, but I still just kept quiet most of the time." He played in South Orange Little League as a child. Damon attended Dr. Phillips High School in Orlando when during his senior year in 1992, he was rated the top high school prospect in the country by Baseball America, was named to USA Today's High School All-America team, and was the Florida Gatorade Player of the Year. Damon also played football in high school, once getting hit by Warren Sapp and sustaining the first concussion in his life. Damon was selected by the Kansas City Royals in the first round (35th overall) of the 1992 amateur draft. He made his Major League debut on August 12, 1995 after playing the previous season with the minor league Wichita Wranglers. He played for the Royals from 1995 to 2000. He scored 104 runs in 1998 and 101 runs in 1999. One of his best seasons came in 2000 when he led the American League in runs with 136 and stolen bases with 46, as he was second in hits (214), at bats (655), and plate appearances (741). Damon spent 2001 with the Oakland Athletics. In a three-way trade involving the A's, Royals, and Tampa Bay Devil Rays, the A's received Damon along with pitcher Cory Lidle from the Devil Rays and second baseman Mark Ellis from the Royals. He was third in the league in at bats (644) and seventh in runs (108). On December 21, 2001, Damon signed a four-year, $31 million contract with the Boston Red Sox. In 2002, he led the league in triples (11) and was third in infield hits (25), becoming the first player selected by the fans in the inaugural American League All-Star Final Vote. On June 27, 2003, Damon became only the second major leaguer since 1900 to record three base hits in an inning, when he did so against the Florida Marlins. Also, Damon suffered a head-on collision with Damian Jackson. He had a concussion, while Jackson walked off the field fine. In 2004, Damon was second in the league in runs (123) and began to re-establish himself among the premier lead-off hitters and center fielders in the game. In arguably his best season in the Major Leagues, Damon batted .304 with 20 home runs and 94 RBIs and showed improved patience at the plate. According to his autobiography, he was only the fourth leadoff batter in the history of Major League Baseball to drive in more than 90 runs in a season. 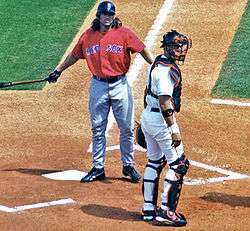 In Game 7 of the 2004 ALCS, Damon hit two home runs, one of which was a grand slam, to lead the Red Sox to victory over the Yankees. In the 2004 World Series, he also hit a home run as the Red Sox won the series against the St. Louis Cardinals in a four-game sweep. Through his four-year career with the Red Sox (2002–2005), Damon appeared in 597 games (590 in center field and seven as a designated hitter) and hit 56 home runs. Of his 2,476 at bats, 2,259 were as leadoff hitter. Damon batted second in the lineup for 156 at-bats in 2002, accounting for nearly all of the rest except for occasional pinch hit. He started two games as the third hitter in 2004, and in 2005, he had 624 at-bats, and all but three as the lead-off hitter. He also earned his second All-Star selection, starting as the American League's center fielder. He led the AL with 35 infield hits, and matched the 35 doubles he'd hit in 2004. On December 20, 2005, Damon signed a four-year, $52 million contract with the New York Yankees. The Red Sox stood firm on a three-year contract and chose not to negotiate against a five-year deal proposed by agent Scott Boras. Damon's signing with the Yankees led to his being subsequently vilified by many Red Sox fans because of his previously professed loyalty to the city and Red Sox organization, including his now infamous statement in May 2005, where he claimed, "There's no way I can go play for the Yankees, but I know they're going to come after me hard. It's definitely not the most important thing to go out there for the top dollar, which the Yankees are going to offer me. It's not what I need." As the Yankees have a strict dress code for players forbidding both long hair and facial hair beyond neat mustaches, Damon had his shoulder-length "cave man" hair cut and beard shaved on December 22. Damon, who had a clean-cut appearance until his third season with the Red Sox, had been planning on cutting his hair and shaving his beard off even if he didn't sign with the Yankees, but waited until after he signed with them in order to prevent speculation. The following season, in a pivotal five game series in August between the Yankees and Red Sox at Fenway Park, Damon went 3-for-6 in each of the first three games, including a doubleheader on August 18, and a game on August 19. Damon hit two home runs, drove in eight runs, and scored eight runs in the first three games as the Yankees won by a combined score of 39–20 and dealt a severe blow to the Red Sox 2006 play-off aspirations. In 2006, Damon finished 3rd in runs (115) and 9th in stolen bases (25) in the AL, while hitting 24 home runs, his career high. He also tied his mark of 35 doubles from the previous two seasons. He was only one of 4 players in the major leagues to hit at least 24 home runs and steal at least 24 bases. On June 7, 2008, Damon went 6 for 6 in the Yankees 12–11 win over the Kansas City Royals, including a walk-off ground-rule double, which had bounced over the wall. He is the first Yankee to have six hits in a 9 inning game since Myril Hoag accomplished the feat in 1934. Damon said in a post-game on-field interview that this was his first walk-off as a Yankee. The Yankees placed Damon on the 15-day disabled list for the first time in his MLB career on July 6, 2008 with a bruised AC joint in his left shoulder. The injury occurred a day earlier when Damon collided with the outfield wall in an attempt to catch a triple. At that time, Damon was one of only three active major league ballplayers who had played at least 10 years in the majors without going on the disabled list. He returned to active duty, and hit 27 doubles for the season. Damon hit 53 home runs in his three complete seasons with the Yankees. On July 27, 2009, Damon hit his 200th career home run against the Tampa Bay Rays' Brian Shouse. For the 2009 season, he batted .282, and tied for the lead among American League left fielders in errors (with 5), while he was 4th in the league in runs scored (107). Johnny Damon hit a home run in Games 3 and 4 of the 2009 ALCS, defeating the Los Angeles Angels of Anaheim in 6 games. When the Yankees went on to play the Philadelphia Phillies in the 2009 World Series, Damon got credit for stealing two bases in one play when the Phillies defense was shifted against batter Mark Teixeira. Damon got his second championship ring as the Yankees would eventually defeat the Phillies in 6 games. Damon, after winning his second World Series, entered free agency after the 2009 season despite expressing his desire to return to the Yankees. He insisted that the Yankees not even make him an offer, however, unless they pay him at least the $13 million he earned for the past four years. As a result of his contract demands, the Yankees signed 1B/DH Nick Johnson to a one-year/5.5MM deal, despite Damon lowering his salary demands at the last minute. The Yankees then signed outfielder Randy Winn to a one-year $2 million deal which essentially closed the door on Damon's return to the Bronx. On February 22, 2010, Damon agreed to a one-year, $8 million deal with the Detroit Tigers. On April 14, 2010, he recorded his 1,000th career RBI against the Kansas City Royals. On May 1, he hit a walk-off home run against Los Angeles Angels of Anaheim pitcher Scot Shields at Comerica Park to win the game 3–2. On July 6, Damon recorded his 2,500th career hit off Jake Arrieta of the Baltimore Orioles, and hit a walk-off home run off David Hernandez, giving the Tigers a 7–5 win. For the season, he batted .271, and became a free agent at the end of the season. On January 21, 2011, Damon agreed to a one-year, $5.25 million deal with the Tampa Bay Rays. The Rays also signed his former Boston Red Sox teammate Manny Ramirez in a package deal suggested by agent Scott Boras. Also reunited with Damon was former Red Sox player Kelly Shoppach. Manager Joe Maddon said he expected the 37-year-old Damon to often be replaced by Sam Fuld during the season late in games that the Rays are leading. After Ramirez's abrupt retirement, this would be moot as Damon primarily would play as the designated hitter. On April 16, 2011, Damon had the game-winning hit for the fifth consecutive game for the Rays, two of which were walk-off hits. On June 29, 2011 Damon tied Ted Williams for 71st on the all-time hit list with 2,654 hits. The hit came at Tropicana Field in the bottom of the 6th inning. On July 2, 2011, Damon went 4-for-4 and his first-inning single moved him past Ted Williams on the all-time hit list. He would finish the season 57th all-time with 2,723 career hits. In Game 1 of the ALDS, Damon hit a 2-run home run in the 2nd inning off Texas Rangers starting pitcher C. J. Wilson to give his team an early 2–0 lead. The Rays won the game 9–0, however they eventually lost the best-of-five divisional series 3–1. On April 12, 2012, Damon signed a one-year minor league contract with the Cleveland Indians for $1.25 million (and an additional $1.4 million in incentives). On May 1, Damon was called up to Cleveland. He made his debut on May 2, batting leadoff against the Chicago White Sox. He finished the game 0–3 with a walk. Indians manager Manny Acta dropped Damon to seventh in the batting lineup after going 4–29 in the leadoff position, including 2 hits in his last 18 at-bats. On June 26, in a game against the Yankees, Damon became the 52nd player in MLB history to amass 2,750 career hits. Heading into the All-Star break, Damon had 35 hits in 163 official at-bats and was hitting .215 in 50 games. On July 20, Damon tied a season-high with three hits versus the Baltimore Orioles. Damon was designated for assignment on August 3, 2012. He was released by the Indians, along with pitchers Derek Lowe and Jeremy Accardo, on August 9. Damon hoped to be signed for 2013, and offered the Yankees the opportunity to sign him to a contract for the league's minimum salary as a replacement for the injured Curtis Granderson, also expressing a willingness to be released once Granderson returned. The Yankees indicated that they were not interested in signing Damon. Damon remained unsigned for all of 2013, and did not play. In late 2013 and early 2014 Damon indicated a desire to keep playing, in part to have the opportunity to attain 3,000 hits. (He needed 231 to reach that goal.) He told members of the media that he has stayed in good physical condition and hoped to receive invitations to spring training. Damon did not receive any offers prior to the start of the 2014 season. In a May 2014 interview while in Boston to celebrate the 10th anniversary of the Red Sox 2004 World Series championship, Damon indicated that he has no plans to officially announce his retirement, even though he acknowledged that he will likely not play in the major leagues again. He also stated that he still wants to play, has continued to stay in good physical condition, and could play if given the opportunity, saying "I feel like if a team calls me, I can be ready. If I play tonight, I'll hit a homer." On June 22, 2014, he played in his first New York Yankees Old-Timers' Day. A July 2014 press report indicated that Damon still hopes to play again in the major leagues. According to the story, in June Damon completed an impromptu session with a batting practice pitcher for the Philadelphia Phillies, who was impressed enough to suggest that the Phillies should consider signing him. On August 4, 2014 Damon gave an interview with the WEEI-FM radio show "Middays with MFB" and indicated that while he wants to still play, no teams have expressed an interest, and "those days are over". According to press accounts in December 2014, Damon hoped to play in 2015, and his agent told a reporter "If you ask Johnny, he'd love to come back." In 2005, Damon wrote Idiot: Beating "The Curse" and Enjoying the Game of Life with Peter Golenbock. Damon contributed backing vocals to Dropkick Murphys' 2004 single "Tessie." Damon hosted WWE Raw on December 21, 2009. Damon participated in the Celebrity Apprentice competition in the spring of 2014 in New York City. The shows that he filmed were part of the 2015 season of the show. He was eliminated from the show on the episode which aired on February 2, 2015. Damon has also appeared on the Animal Planet show Tanked. Damon married his high school sweetheart, Angela Vannice, in 1992 when he was 19. They had twins (Jackson and Madelyn) together in 1999 before divorcing in 2002. In 2004, Damon married Michelle Mangan, who gave birth to their first daughter, Devon Rose, in 2007. Damon and Mangan welcomed their second daughter, Danica Rayne, in 2008. Mangan gave birth to twin girls in June 2012 Dasha and Daliah. In April 2015 they welcomed their 5th daughter Dreanna Michelle. Damon and Michelle are expecting a 6th child, the boy is going to be named Dash, as revealed in the Tanked episode on April 22, 2016. Damon and his family reside in Windermere, Florida. While with the Yankees, Damon and his wife lived in Cresskill, New Jersey. He is active with the Wounded Warrior Project, which works to raise awareness and enlist the public's aid for the needs of severely injured service men and women. Damon has appeared on MTV Cribs where he gave a tour of his home near Orlando, Florida. Damon was one of the victims of the $8 billion fraud perpetrated by convicted wealth manager Allen Stanford. ↑ "Johnny (Idiot) Damon Is the Yankees' Most Likable Savior In Years". New York Magazine. April 3, 2006. Retrieved August 23, 2010. ↑ "JockBio: Johnny Damon Facts". 1 2 "Johnny Damon from the Chronology". BaseballLibrary.com. Retrieved September 12, 2008. ↑ "Major League Leaderboard". Fan Graphs. Retrieved September 9, 2009. ↑ "Marlins vs. Red Sox Box Score". ESPN. June 27, 2003. ↑ "ESPN – Johnny Damon Stats, News, Photos – New York Yankees – MLB Baseball". Sports.espn.go.com. November 5, 1973. Retrieved August 23, 2010. 1 2 3 4 5 Chuck, Bill (April 2, 2009). "100 random things about the Red Sox, Rays, and Yankees". The Boston Globe. Retrieved May 2, 2009. ↑ "Baseball Leaderboard". Fan Graphs. Retrieved August 23, 2010. 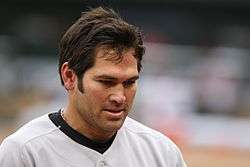 ↑ "Boston Might Not Like Johnny Damon Anymore". Blogcritics.org. Retrieved August 23, 2010. ↑ Hack, Damon (December 24, 2005). "Damon Begins the Short-Haired Portion of His Career". The New York Times. p. D1. ↑ Schmidt, Michael S. (December 24, 2005). "Yankee Cut No Big Deal For Clipper". The New York Times. p. D5. ↑ "Damon in N.Y. with shave, haircut, more than two bits". ESPN.com. Associated Press. December 23, 2005. Retrieved June 4, 2011. ↑ "Six Hits in One Game by Baseball Almanac". Baseball-almanac.com. Retrieved August 23, 2010. 1 2 Kepner, Tyler (August 18, 2009). "Damon Feels Like Staying, and the Yanks Seem Willing". The New York Times. Retrieved August 18, 2009. ↑ Kepner, Tyler (December 18, 2009). "In Signing Nick Johnson, Yankees Turn Johnny Damon Away". New York Times. Retrieved December 20, 2009. ↑ Adam Bernacchio (January 27, 2010). "New York Yankees Sign Randy Winn, End the Johnny Damon Era in the Bronx". Bleacher Report. ↑ Kepner, Tyler (January 28, 2010). "Its Farewell to Damon After Yanks Sign Winn". New York Times. Retrieved January 30, 2010. ↑ "Johnny Damon Statistics and History – Baseball-Reference.com". Baseball-Reference.com. ↑ Brown, David. "Red Sox reunion! Manny Ramirez, Johnny Damon sign with Rays". yahoo.com. Retrieved April 3, 2011. ↑ "Manny Ramirez and Johnny Damon excited to join new-look Rays". mlb.com. Retrieved April 3, 2011. ↑ "Tampa Bay Rays' James Shields eager to get on the mound — St. Petersburg Times". Tampabay.com. Retrieved April 3, 2011. ↑ "Shopp talk: Batterymates overpower Rangers — MLB.com". Tampabay.rays.mlb.com. September 30, 2011. Retrieved September 30, 2011. ↑ "Johnny Damon's new deal official". ESPN.com. Associated Press. April 17, 2012. Archived from the original on June 23, 2012. Retrieved July 5, 2014. ↑ Hoynes, Paul (May 1, 2012). "Damon on Indians roster for White Sox series". Cleveland Plain-Dealer. 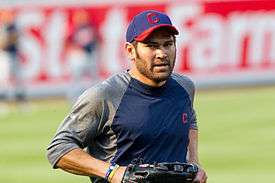 ↑ "Here's Johnny:Indians sign outfielder Johnny Damon". ↑ "Santana, Hafner homer as Indians beat White Sox". Associated Press. May 3, 2012. Retrieved May 4, 2012. ↑ "Fantasy Player News & Updates". Indians.com. May 15, 2012. Retrieved May 16, 2012. ↑ "Johnny Damon stats". MLB.com. Retrieved July 8, 2012. ↑ "Box Score Orioles at Indians – July 21, 2012". SportsIllustrated.CNN.com. Retrieved July 22, 2012. ↑ "Indians recall OF Ezequiel Carrera from Triple-A Columbus". ↑ Gleeman, Aaron (August 9, 2012). "Indians release Johnny Damon". NBCSports.com. Retrieved August 10, 2012. ↑ Birenbaum, Jonah (December 28, 2014). "Scott Boras: Johnny Damon would 'love to come back'". The Score.com. Score Media Ventures. ↑ Nate, Scott (November 4, 2014). "Johnny Damon to join the cast of 'Celebrity Apprentice'". USA Today. ↑ "The Official Site of The New York Yankees: Team: Player Information : Biography and Career Highlights". Arod.mlb.com. Retrieved August 23, 2010. ↑ "WHDH-TV – Sports – Damon, wife welcomed baby girl". .whdh.com. Retrieved August 23, 2010. ↑ Johnny Damon awaits fourth child, second with wife Michelle : Celebrity Baby Blog Archived April 14, 2008, at the Wayback Machine. ↑ Sheldon Ocker. "Indians report: Johnny Damon returns after birth of twin daughters". www.ohio.com. ↑ "Tanked: Johnny Damon is Expecting the Unexpected". Animal Planet. Retrieved April 22, 2016. ↑ Staff. "The Rumble: Off-the-ball look at your favorite sports celebrities", New York Post, September 27, 2009. Accessed February 21, 2011. "With a downstairs living section in their Cresskill home, Damon and his wife, Michelle, welcomed the Robertsons in." ↑ Torre, Pablo (March 29, 2009). "Why Do Pro Athletes Go Broke?". Sports Illustrated. Retrieved September 9, 2009. 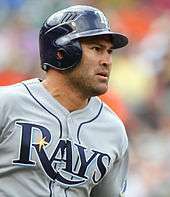 Wikimedia Commons has media related to Johnny Damon.